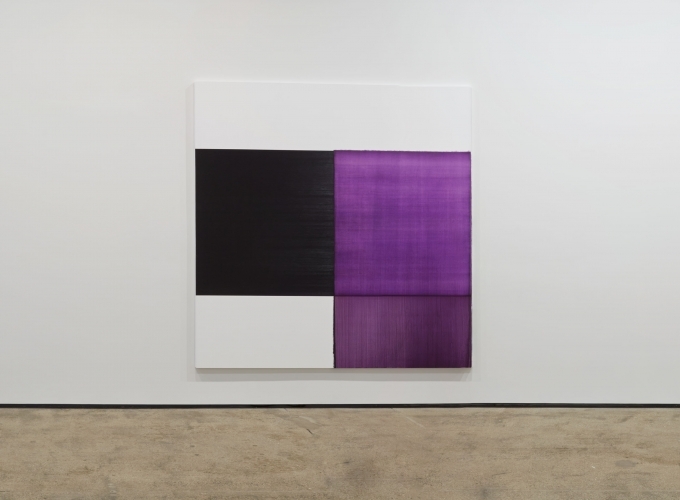 Sean Kelly Gallery is delighted to announce a solo exhibition of new works by Callum Innes. Innes' exhibition is comprised of a specific group of major new 'exposed' paintings. 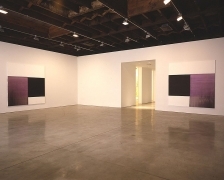 The paintings in the main gallery all employ Scheveningen Black as their base pigment. In the "exposed paintings" a single color, mixed by the artist, is applied to the canvas, turpentine is utilized to remove a section of the paint before it dries. Innes washes away, or as he has described it, "unpaints" the canvas, leaving all but the faintest vestigial traces of color. The result reveals varied veils of color, buried within the seemingly monochromatic single pigment. This interplay between the additive and subtractive processes, making and unmaking, underlies this ground breaking and sophisticated body of work. The lyrical and luminous paintings that result, are both conceptually complex and evocative. The Scheveningen Black paintings, are complimented by a group of medium sized exposed paintings in the second gallery, including a single shellac painting and intimate white on white paintings in the first gallery. Working within an abstract tradition closely linked to minimalism, Innes' strategy is to limit his vocabulary to explore the inherent possibilities of his process. While the technique and 'action' of painting is present in all of Innes' paintings, it is not the sole subject of the work. 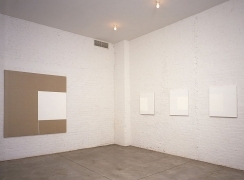 It is perhaps more accurate to posit his work within conceptual practices, rather than within the strictly painterly precedents of minimalism and abstract expressionism. 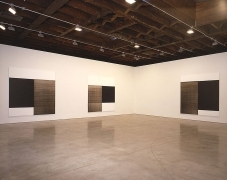 Innes has emerged as one of the most significant abstract painters of his generation achieving widespread recognition through major solo and group shows worldwide. 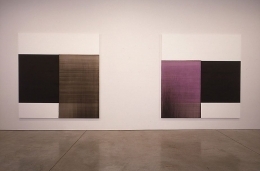 Innes was awarded the Jerwood Prize for Painting in 2002, and the Nat West Prize in 1998. In 1995 he was shortlisted for both the Turner Prize and the Jerwood Prize for Painting. Forthcoming exhibitions in America include a major solo exhibition curated by David Moos, originating in 2004 it will travel to the Birmingham Museum of Art, Birmingham, Alabama and the Henry Art Gallery, Seattle, Washington, amongst other venues and be accompanied by a catalogue. Recent solo exhibitions include The Pier Arts Centre, Stromness, Orkney, Scotland in 2000; the Irish Museum of Modern Art, Dublin; the Kunsthalle Bern, Switzerland in 1999. 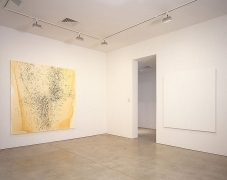 Innes has recently been included in several group exhibitions including: Sphere (loans from nvisible Museum), Sir John Soane's Museum, London; FRESH: Recent Acquisitions, Albright Knox Art Gallery, Buffalo, NY and Heads and Hands, Loans from the nvisible Museum, Washington Project for the Arts, Corcoran Gallery of Art, Washington, DC. Innes' work is included in the permanent collections of many major museums worldwide.